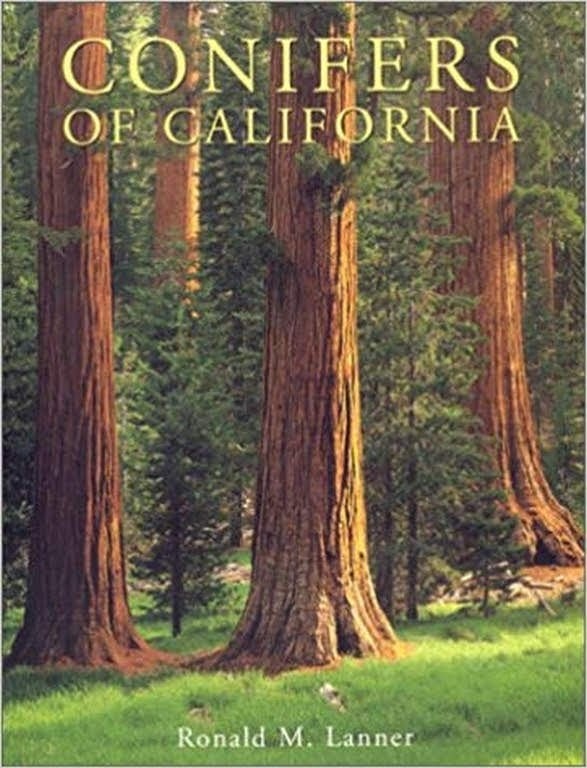 In the book Conifers of California (1999) the jacket cover states that “California is home to 52 native coniferous species; no other state, and, indeed, no other comparably-sized region on Earth contains more conifers...” I've seen all of the 52, but hmm...the most? Hey, wait a second! What about Japan, for that country contains lots of pines, spruces, firs etc.? I went to my Hillier Manual of Trees and Shrubs (2014) because the brief encyclopedic descriptions always list the country or region of origin. 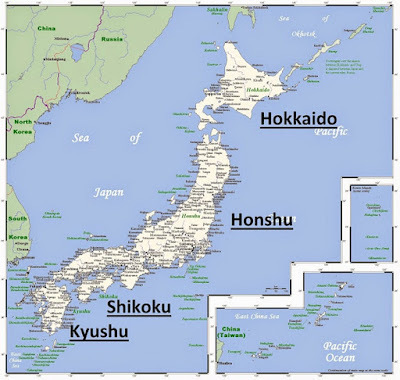 I was hoping that the California claim was wrong and that Japan would reign as champion, but alas there are only 38 species listed from Japan. 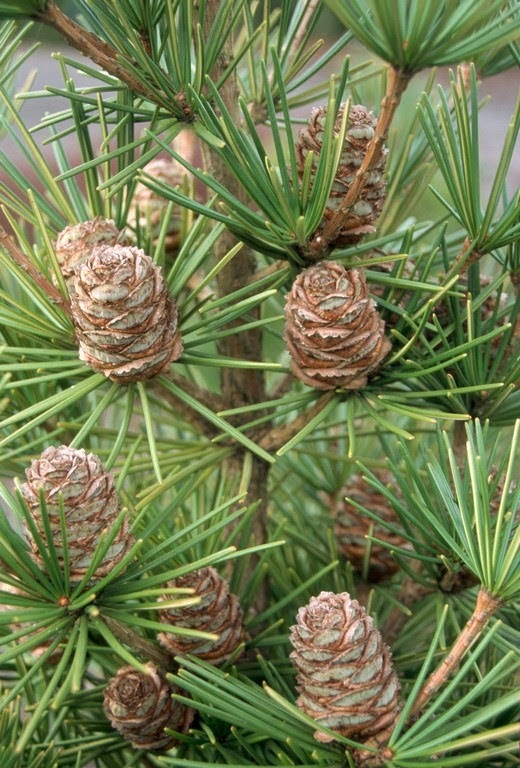 I have seen and even grown most of the Japanese species, the one exception being Pinus luchuensis. 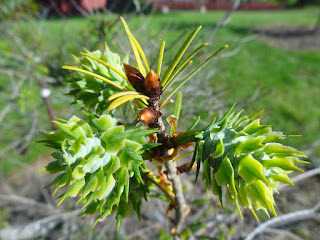 The “Luchu” or “Okinawa pine” is hardy to only 20-30 degrees F, USDA zone 9, so it would be of no use to me. But let's take a look at some of the Japanese coniferous species that I do know. One is Nageia nagi, and it's not very hardy either. 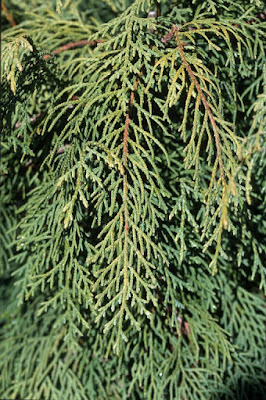 The evergreen genus is in the podocarp family and it is one of those plants that upon first sight you wouldn't think it to be a conifer. I don't grow it for it would take up valuable greenhouse space, but I have seen it growing outdoors in southern California arboreta. The glossy, lance-shaped leaves make it a good complementary accent for the flower bouquets. Nageia is the Latinized version of nagi, and that is the native Japanese word for the tree, so botanically speaking the name is redundant. 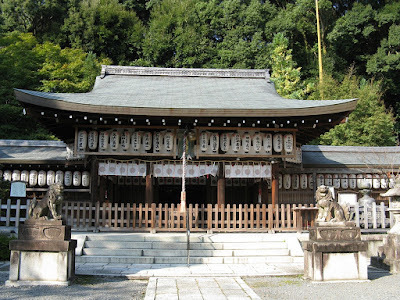 In the Nyakuoji Shrine in Kyoto, Japan, there is a nagi tree that is considered sacred. Nagi can mean two things: 1) calm, as in a morning calm, and 2) to cut down, as with a sword. 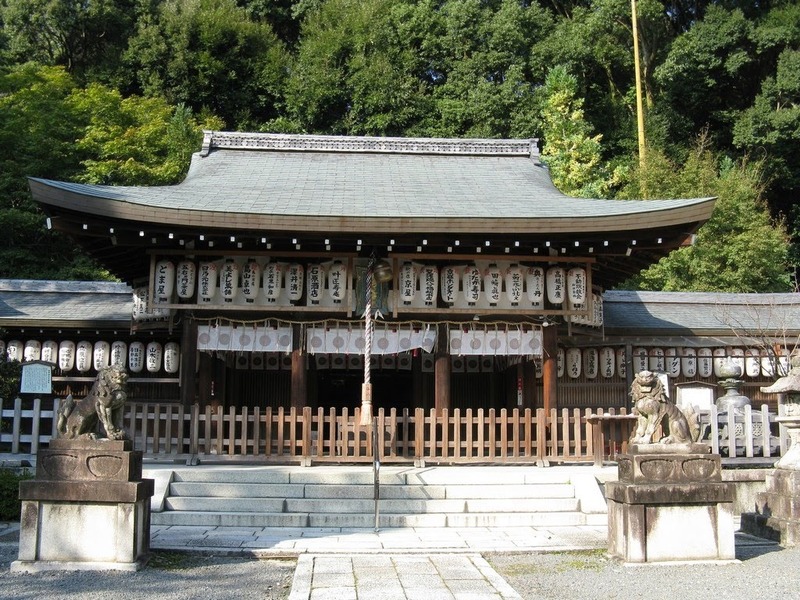 If you pay your respects at the shrine your troubles will be cut away, leaving you calm. 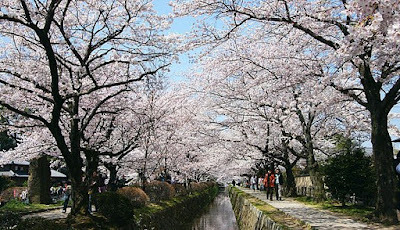 The shrine is small and peaceful without many visitors, and it is located at the south end of the Philosopher's path (Tetsugaku no michi), a pedestrian path that follows a canal lined with hundreds of cherry trees. 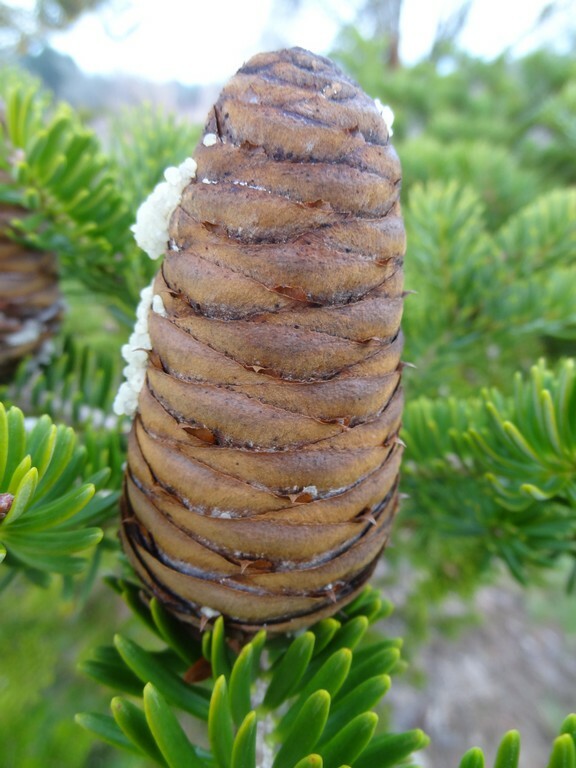 Torreya nucifera is the Japanese nutmeg-yew, an evergreen conifer native to the southern half of Japan. The genus name honors Dr. John Torrey (1796-1873), an American botanist and co-author with Asa Gray of The Flora of North America, while the specific epithet means “bearing nuts.” Leaves are evergreen and give off a pleasant fragrance when bruised. As a member of the yew family (Taxaceae), the fruit is a single seed covered by a fleshy aril, and it is rich in oil and edible. 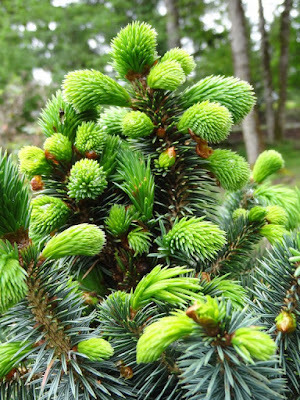 Known as Kaya in Japan, it was first scientifically described by Engelbert Kaempfer in 1712 and was included in the Linnaeus Species Plantarum in 1753 as Taxus nucifera. E.H. Wilson photographed a large tree in Kyushu, Japan in 1916 which was 28m tall and 5.5m in girth, and could possibly have been 500 years old. Wilson wrote that “the wood is yellowish to pale brown, firm and lustrous and durable in water. It is used for making water-pails and for cabinet work.” The species is probably hardy to USDA zone 6 or 7. 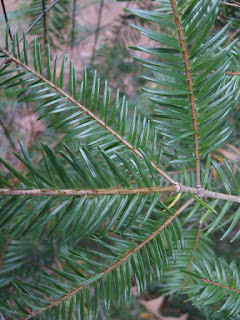 Wilson continues about the nutmeg, that “in one place only is it common, and that is on Takao san, a hill some 500 m high, about 27 miles southwest of Tokyo, growing with Abies firma.” A. firma is known in Japan as momi, and that word simply means “fir.” According to Hillier it is a large tree which can reach 40 m or more in the wild. 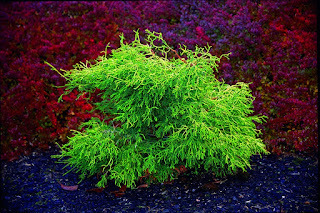 The typical American nurseryman or gardener knows nothing about A. firma, and wouldn't know one if they saw it. It is simply in no demand or availability at American garden centers, but to the horticultural cognoscenti it is recognized as an important species. 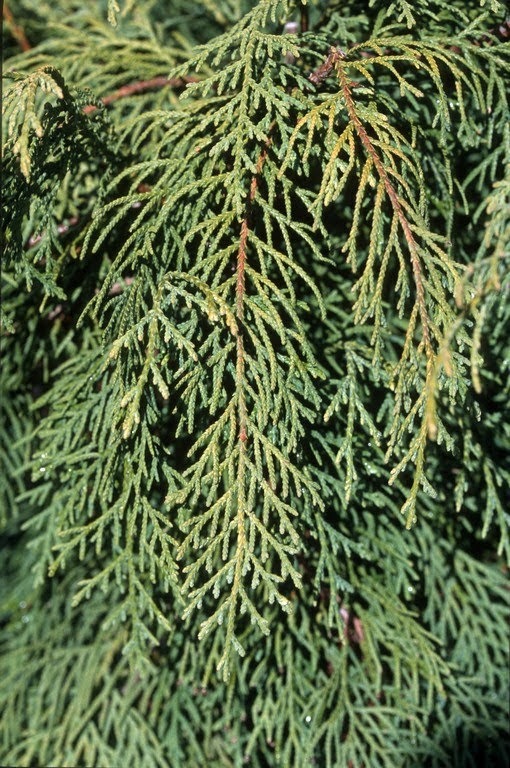 In many parts of Europe and America it doesn't matter, but in areas of high temperatures (especially at night) and high humidity, A. firma is known to survive when other fir species sigh, falter, then expire. 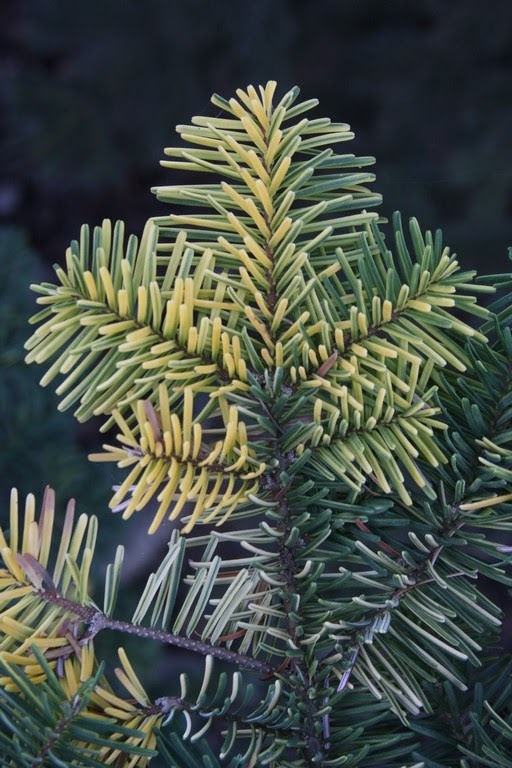 It can take the heat, therefore it is a preferred rootstock to be used for the cultivars of other Abies species in areas such as the miserable American southeast. But even on its own it is an attractive tree and I have grown Abies firma 'Nana Horizontalis' – whether or not that is a legitimate name – and also A. f. 'Halgren' which was a discovery of Gordy Halgren of Peacedale Nursery, where his selection was noted for exceptional vigor and very dark glossy-green needles. 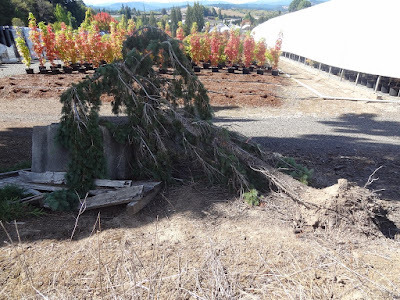 We root the 'Halgren' then use it as rootstock for a wide array of Abies cultivars, a process more costly than just buying in other fir seedlings as rootstock. Then we have the arduous task of keeping track of the rootstock used when we advertise and sell a specimen 5-to-10 years later. 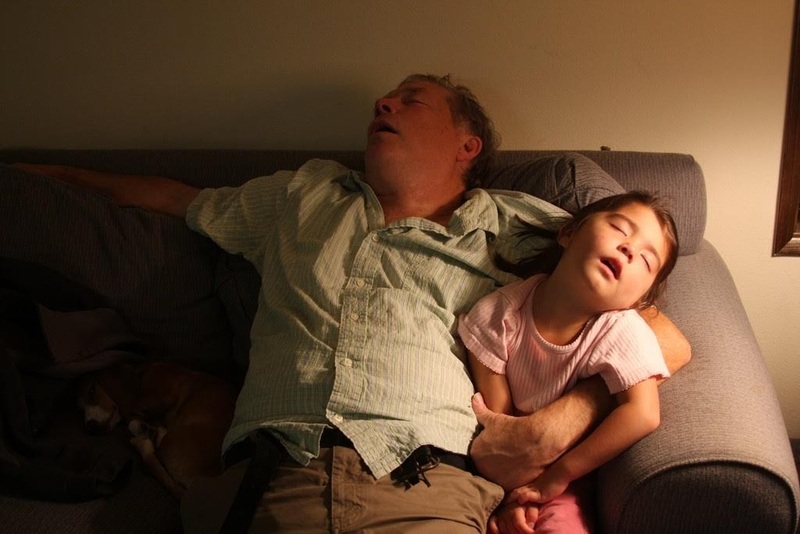 Remember: employees come and go, and they are never as committed to accuracy and knowledge as the owner. Not one of my current employees – who, still, all nurseries would want to recruit – could answer the question of what is the preferred rootstock for Abies cultivars planted in the southeast USA. TMI – too much information I suppose. Early in my career I was impressed to discover that Oregon's common “Douglas fir,” Pseudotsuga menziesii, had relatives in Asia, in both China and in Japan. My Flora Farm residence is host to two magnificent specimens of the Oregon Douglas fir – huge and well over 100 years old – and underneath them I planted the Asian species, Pseudotsuga sinensis and Pseudotsuga japonica. 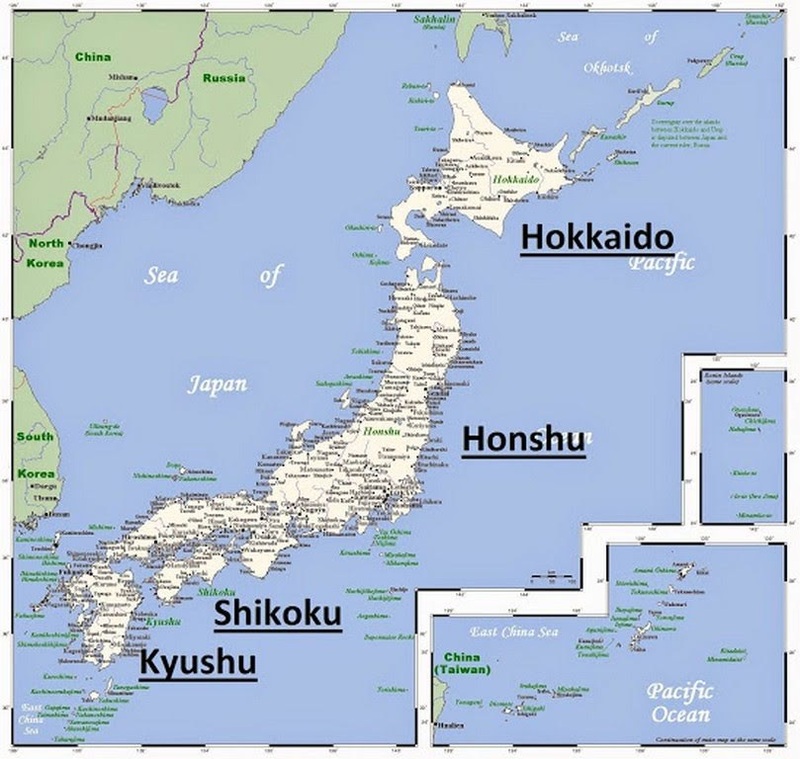 I would love to see them hybridize – kind of like I did with wife Haruko – but I don't suppose that any recognized crossing will materialize in my lifetime. Maybe at a future date someone will praise old geezer Buchholz for bringing the transcontinental species together. Wow! – like Buchholz was able to score a Chinese and a Japanese wife. What will the offspring look like? Interesting...at the least. 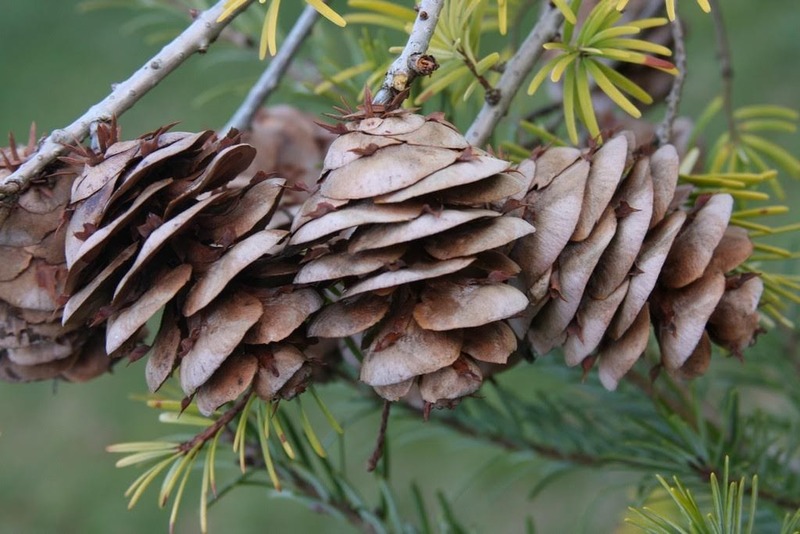 I suppose I'm most fascinated with the cones of these species: the Chinese being fat and amber and the Japanese being sharp and dark and narrow and the American being in-between. Anyway, I love Pseudotsuga cones, and though they are “false hemlocks,” the cones are far more impressive than the little things produced on “true” hemlocks. 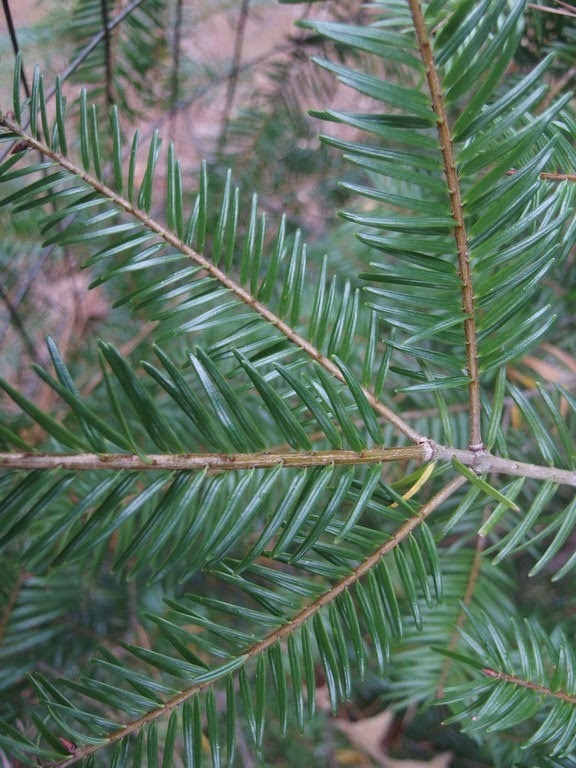 It's too bad that the Scotsman David Douglas, who championed the American Douglas fir, was never aware that related species in the genera also existed in Asia. 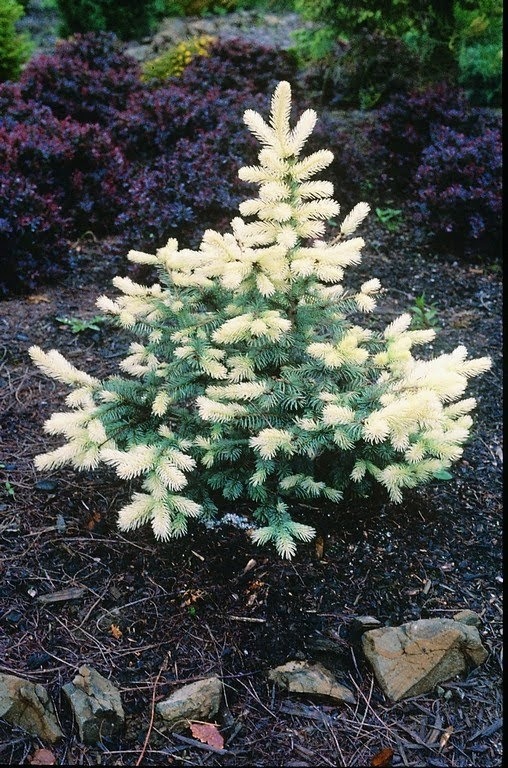 Of course all the Pseudotsuga originally were classified as pines (Pinus) anyway. I keep earlier editions of the Hillier Manual of Trees and Shrubs around to compare with changes in the latest, 2014 edition. 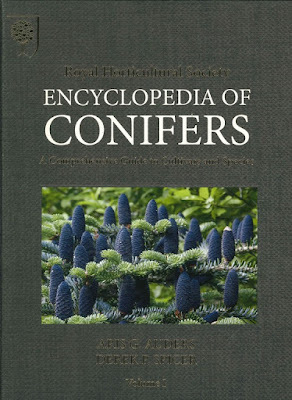 In the 1981 5th edition, for example, Juniperus conferta is listed as the “Shore juniper,” a native of Japan and Sakhalin “found on sandy sea-shores.” I was surprised to read that it was introduced by E.H. “Chinese” Wilson in 1915, as you would have thought someone would have introduced it long before. 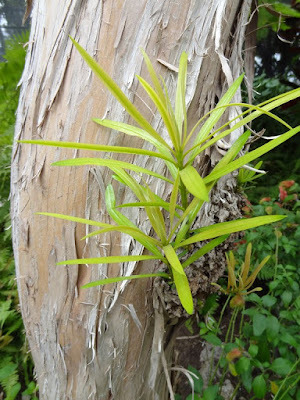 In the 2014 edition we learn that it is now classified as J. rigida subsp. conferta. Hillier has also added a few sentences to the description, calling it an “invaluable ground-cover species,” and uses poetry practically by referring to “dense prickly carpets of apple-green foliage.” Apple-green – I like that. We have a specimen growing in our Blue Forest of J. conferta...er, rigida subsp. conferta 'Blue Lagoon'. I just went out to look at it – hopefully nobody saw me staring at it for five minutes – but I think it is poorly named. I can detect nothing blue at all, only silver and green, but it is a dense mat less than one foot tall and a whopping 51' (15.5 m) wide. Podocarpus macrophyllus is the Japanese “Sweet Kusamaki,” an evergreen conifer from southern China and Japan. 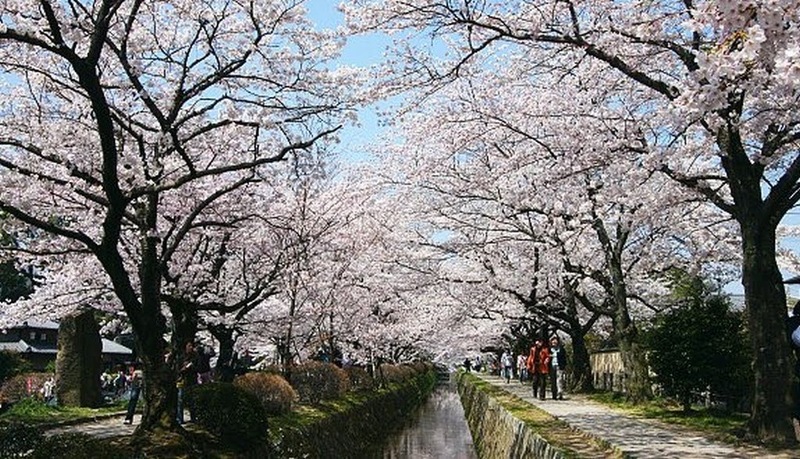 It is commonly seen in Tokyo, used as a single specimen or effective as a hedge. Careful with children, however, because the purple-red fruits on female plants are poisonous if eaten. 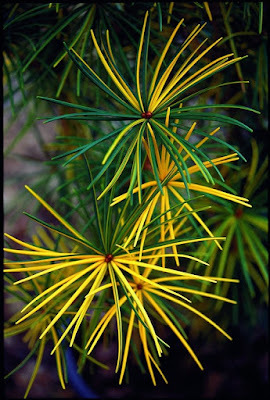 When I was young I grew one as a houseplant, and though the species is in the Podocarpaceae family, I knew it as the “Buddhist pine,” and it was purchased cheaply at the grocery store. It is more highly valued in Hong Kong because it is considered a Feng Shui tree, a Chinese pseudoscience* that believes energy forces harmonize individuals with their surrounding environment. I have been growing Larix cultivars since I began my nursery, but I never really know if the “Japanese larch,” Larix kaempferi, is the correctly identified species or if it is sometimes Larix decidua, the “European larch,” and vice versa. The new shoots of the Japanese are reddish in color while the European's shoots are yellow-to-gray, but in spring I'm too busy to walk around and study the larches. It is confusing, though, to have a L. d. 'Pendula' as well as a L. k. 'Pendula'. 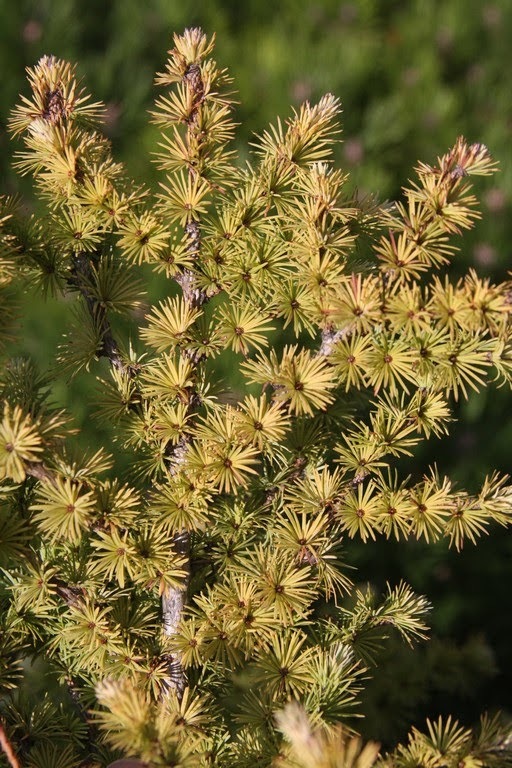 A German nursery woman visited us twenty years ago and she was pleased to see Larix kaempferi 'Diana'. Please because her employer found it in the wild in Germany (1974). “Wait a minute,” I thought later that night, “how could he have found a Japanese species in a German forest?” I saw her again the next day, and demanded an explanation. 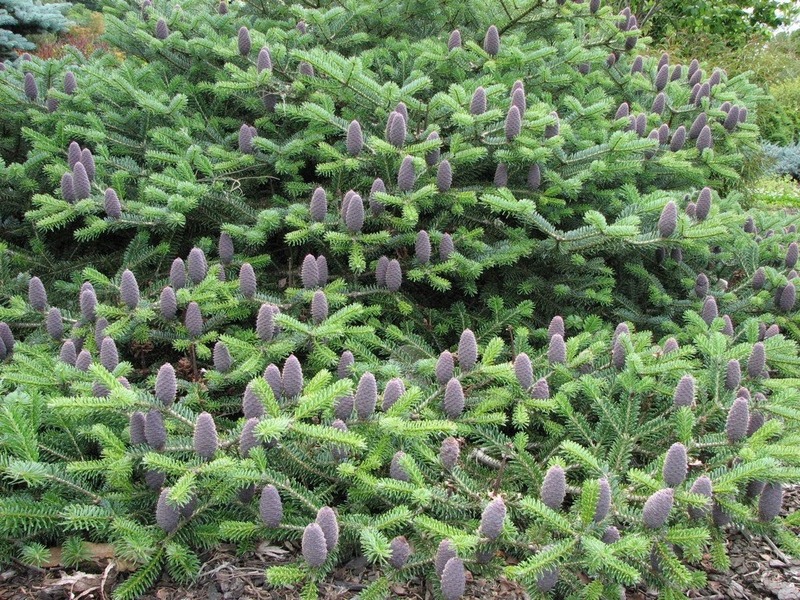 She reported that Larix kaempferi was commonly used in German reforestation, as it thrives in heavy soils unlike Larix decidua. So she was off the hook after all. 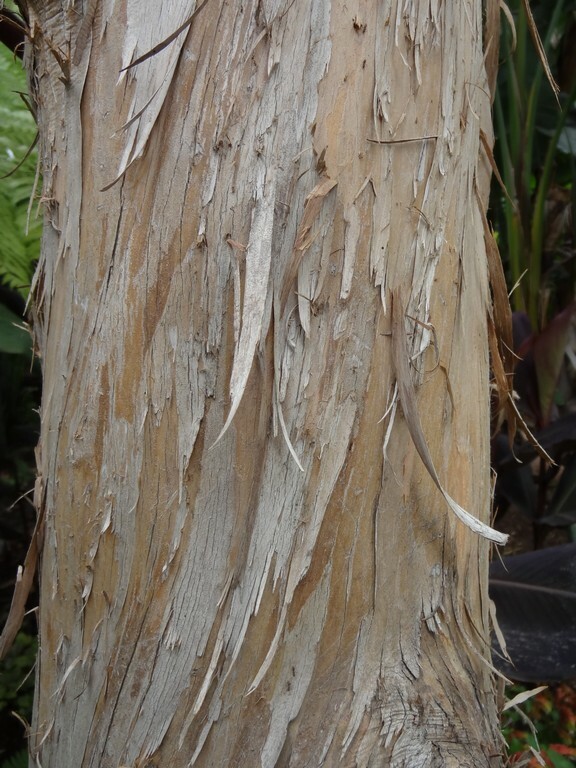 We don't sell Sciadopitys verticillata any more – the straight species that is. 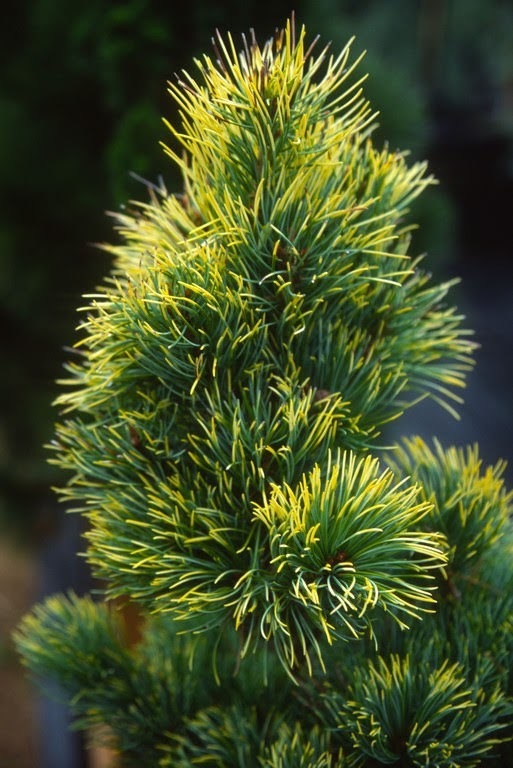 The “Japanese Umbrella pine” (Koyamaki) used to be in high demand for a high price, but today's gardeners have been spoiled into wanting only cultivars. That's ok because one can root or grow from seed the rootstock, then grafts take virtually 100%. 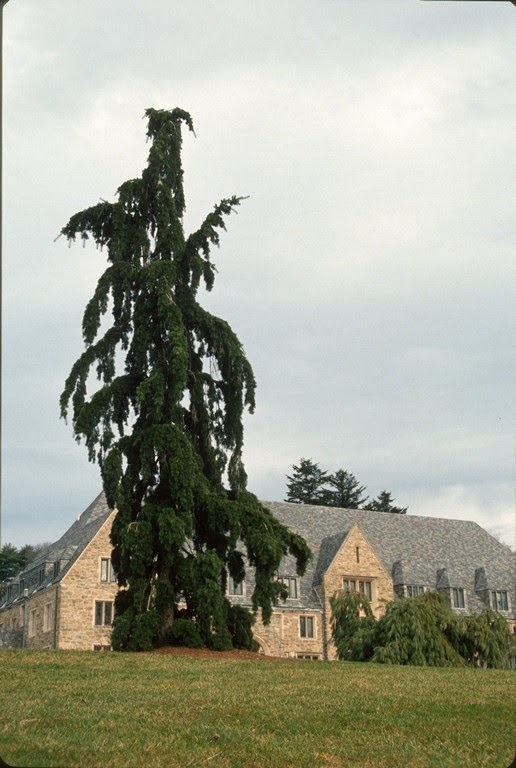 The Hillier Manual of Trees and Shrubs says that Sciadopitys “should be planted in every representative collection of conifers,” but then the book lists only one cultivar – 'Sternschnuppe' – from Wittbold-Muller in Germany, before 1984. But Europe is full of interesting cultivars besides 'Sternschnuppe' (shooting star), and I have been to W-M's nursery and they have introduced many other very nice cultivars. 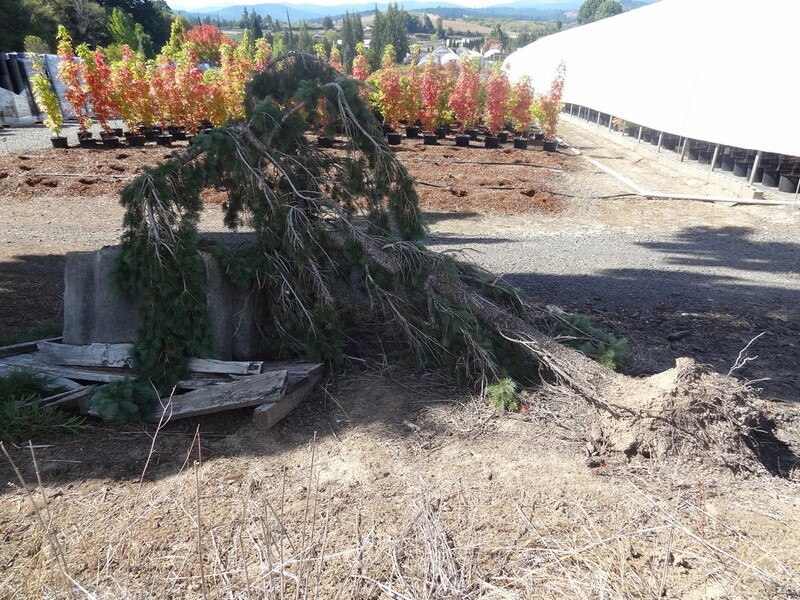 The nursery was a well-tended showplace 18 years ago upon my first visit but has fallen on hard times since. It was sad a few years ago to see row after row of umbrella pine ruined because they were growing into each other, and apparently there wasn't a market for them anymore. *The Baltic region is on the other side of the world from Japan, but it is home to the largest known deposit of amber, known as Baltic amber. 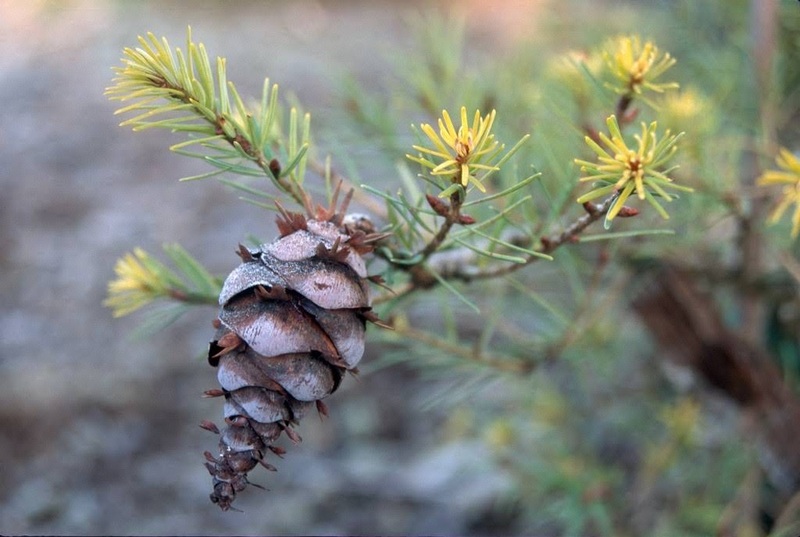 Infrared microspectroscopy of the amber suggests that conifers of the family Sciadopityaceae were responsible, and the process dates from about 44 million years ago. 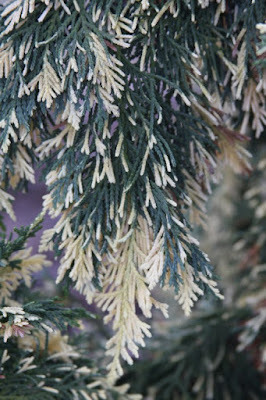 Thuja standishii (nezuko in Japanese) is an evergreen conifer native to southern Japan. 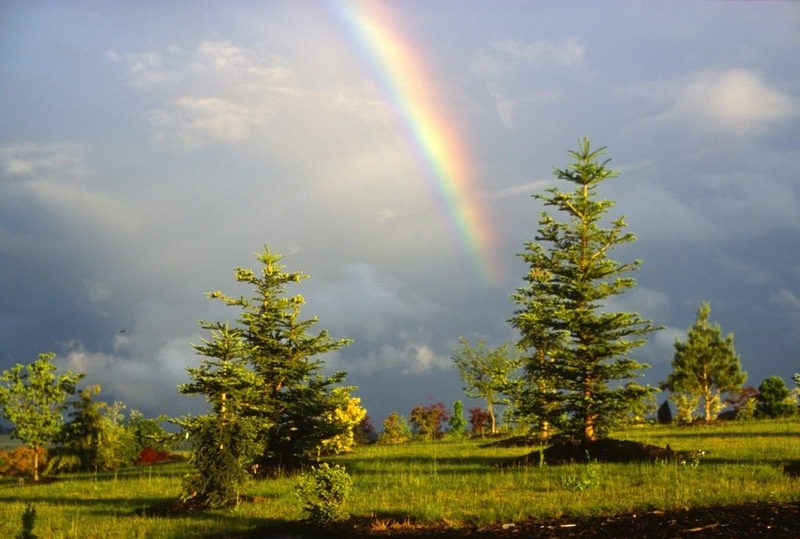 As a timber tree it is grown in plantations for its waterproof, and pleasantly-scented wood. Along with Chamaecyparis obtusa (hinoki), Sciadopitys (koyamaki), Chamaecyparis pisifera (sawara) and Thujopsis dolabrata (asunaro), they and Thuja standishii comprise the “Five Sacred Trees of Kiso.” Temples were built from these five trees, but the great Kiso Forest was off limits to the common people, and if they were caught poaching they were punished with death. 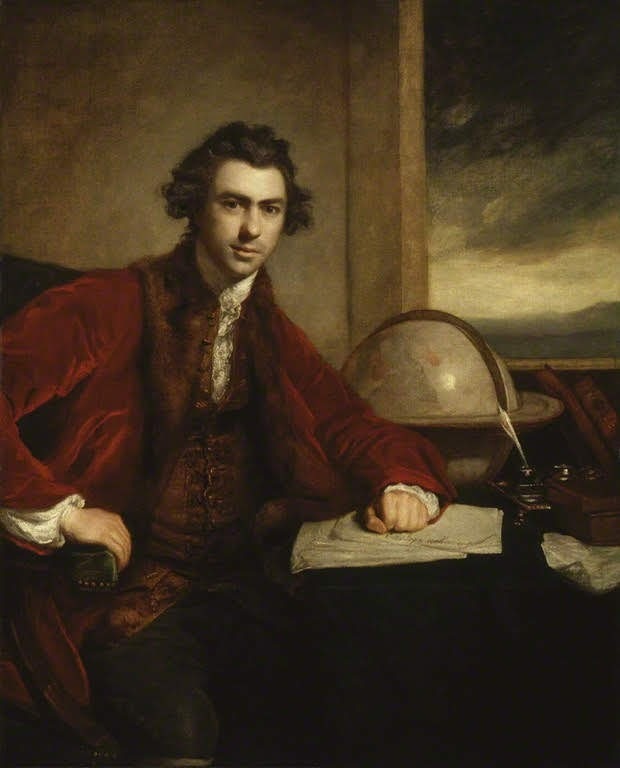 In spite of such drama the botanic name is rather boring: the genus name is the Greek name for a kind of juniper and the specific name honors English nurseryman John Standish (1809-1875). 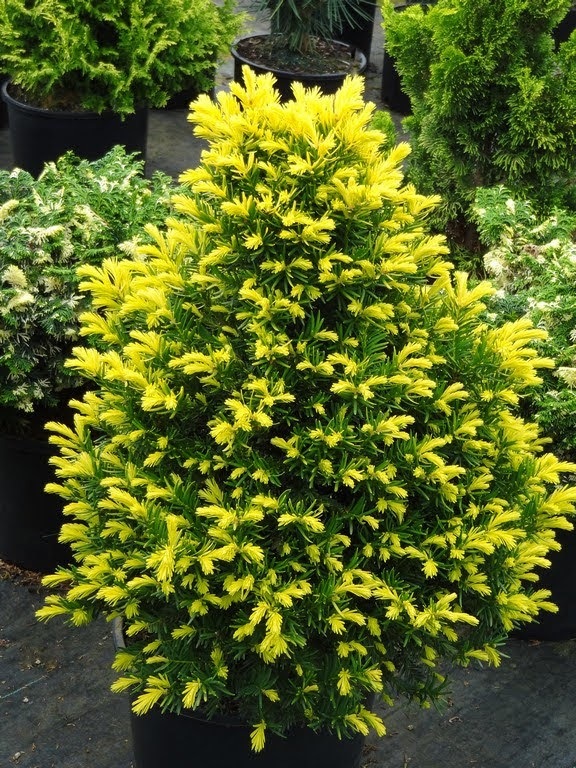 Besides the Thuja we have a Lonicera standishii and a golden Taxus baccata 'Standishii' and Standish and Noble at Sunningdale produced Rhododendron hybrids. 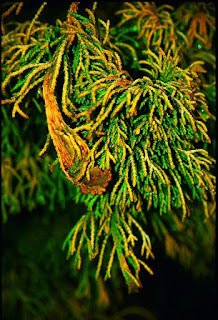 Thujopsis looks kind of like a Thuja on steroids, in that the former displays larger leaves on flatter branchlets, in fact it has been commonly called the “Elkhorn cypress.” Thujopsis propagates easily by rooted cuttings but I suppose it would be compatible grafted onto the various species of Thuja. 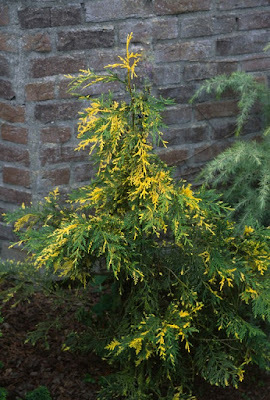 Thujopsis is a monotypic genus and the opsis part of the name means “resembling,” resembling Thuja. The specific epithet dolabrata means “hatchet-like,” referring to the shape of the stomata. 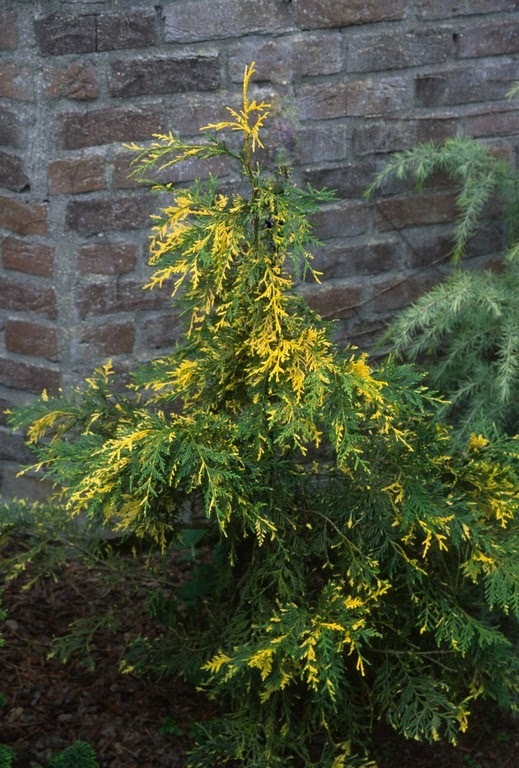 * Thujopsis is commonly found in arboreta – hardy to USDA zone 5 – but is not so common in home landscapes. 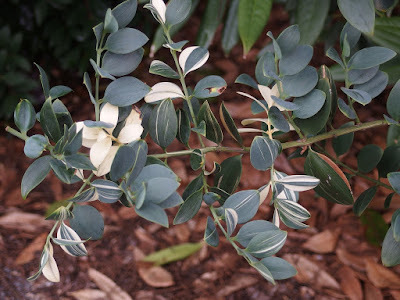 I used to grow 'Variegata' but sales were weak because of its ungainly growth habit and because the portions of cream-white foliage were not very stable. 'Nana' is a better cultivar with its dwarf, compact spreading form, and where all parts are smaller than the type. 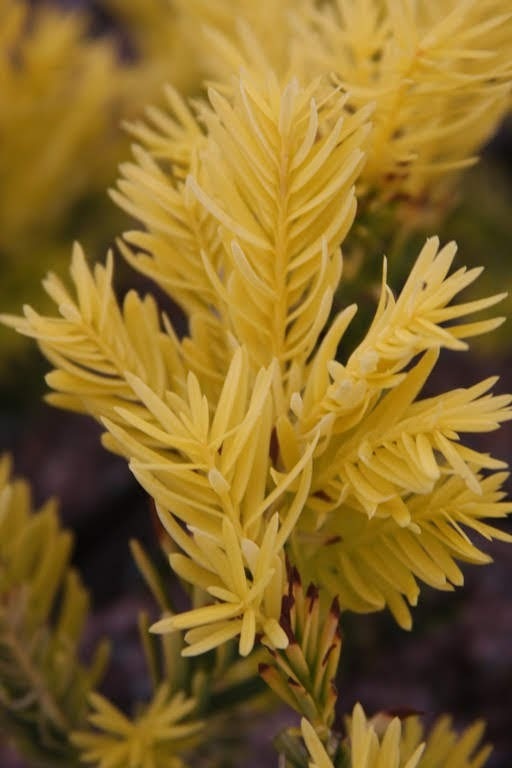 I don't understand why Thujopsis is not more common in landscapes – it is certainly attractive and easy to grow – but then I am not on a mission to convert anyone just because I like a certain conifer. 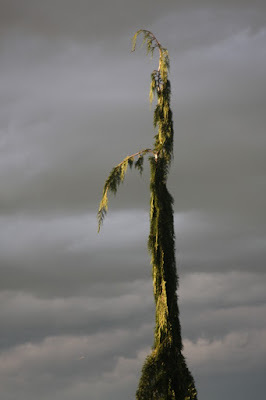 The beautiful specimen photographed above thrives in Portland, Oregon's Hoyt Arboretum amongst the weeds where it receives no care or supplemental irrigation. I suppose that less than one out of a thousand visitors to the arboretum have ever noticed it...which is a shame. *In botany, a stoma (plural stomata) is the Greek word for “mouth,” and it refers to a pore that facilitates gas exchange, usually found on the underside of the plant leaves. The typical nurseryman – like me – detects no difference between Taxus baccata, the “Common” or “English yew,” and Taxus cuspidata, the “Japanese yew.” There are plenty of cultivars for each species, but since T. cuspidata comes from northeast Asia it is more winter hardy than T. baccata. 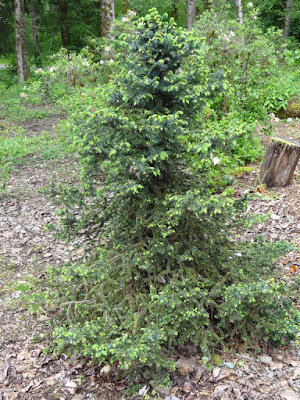 In cold areas one could also try growing Taxus x media – the hybrid between the two species – that has the unceremonious common name of “Anglojap.” If you encounter the specific name of T. caespitosa, just know that it is a synonym of T. cuspidata. I find T.c. 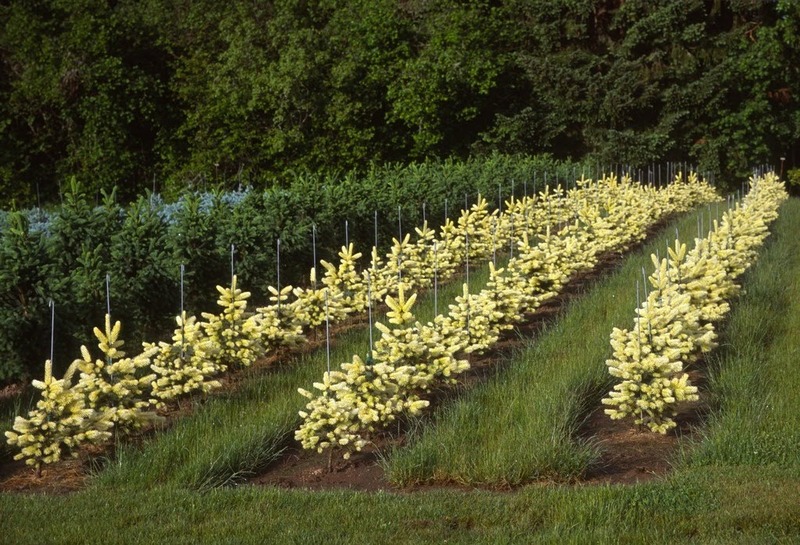 'Rezek's Gold' to be an attractive cultivar, although it must be perfectly sited in Oregon. If in full PM sun it will burn in summer, but if grown in too much shade it will appear greenish. 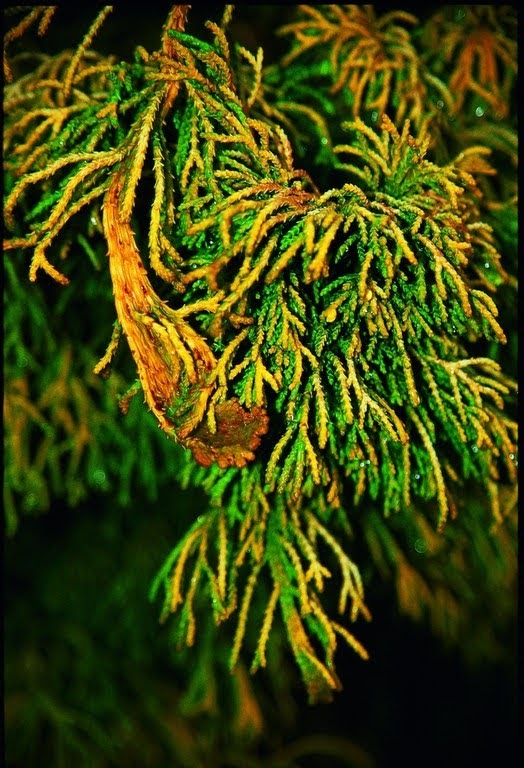 The selection, from the late Ed Rezek of New York, has been variously labelled Taxus 'Rezek's Gold', Taxus baccata 'Rezek's Gold', Taxus caespitosa 'Rezek's Gold' and Taxus cuspidata 'Rezek's Gold', but since the late Edward Rezek sent it to me with the latter name, about 15 years ago, that is the name that I use. 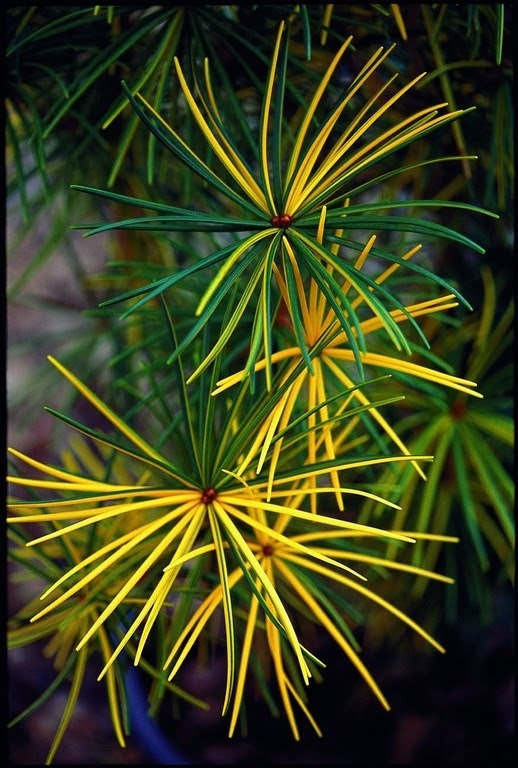 For what it's worth, the Royal Horticultural Society's Encyclopedia of Conifers differs and lists 'Rezek's Gold' as a species of T. baccata. Obviously I wonder who, who has decided that, who has concluded that? It is not an unimportant question...since I don't want to purvey plants that are not sufficiently winter-hardy to survive in cold areas. 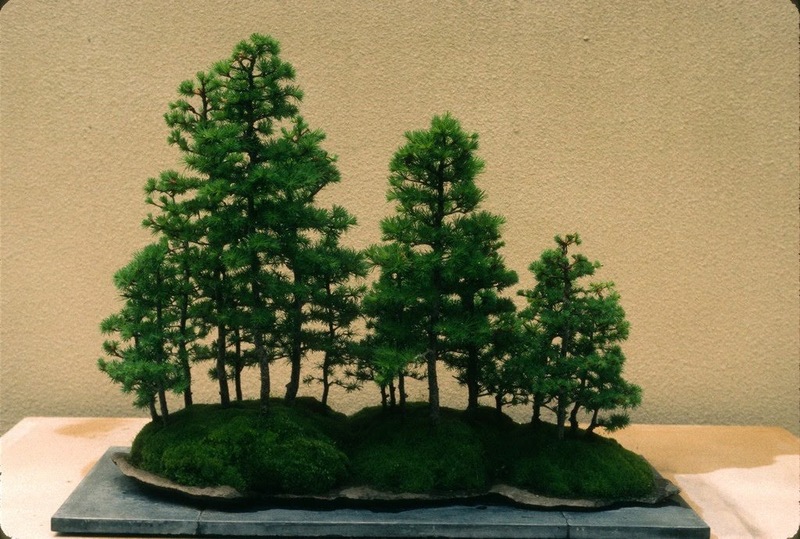 Today's blog has purposely championed a lot of little-known or under-appreciated conifers from Japan. One reason is so that I can research and learn a little more about them too. It is one thing to grow, and even to sell, a Japanese species, but quite another to really know the intimacies of the species, to know the real creature. The nurseryman has the upper hand over the botanist and the taxonomist, those who deal with dead, pressed herbarium specimens. The nurseryman, on the other hand, feels, smells and has to scrub the pitch off his hands when he works with the plants, so we know them very differently than the botanist. And then, of course, the botanist's livelihood doesn't depend on the plant or a crop to survive and thrive under his care, whereas the nurseryman still has children to feed. I would much rather that my precious daughter marry a hard-working, dirty nurseryman over a clean finger-nailed botanist, but maybe that's because I am a dirty nurseryman and not smart enough to be a botanist. Anybody, anybody with a sincere or an academic interest in plants is familiar with the Royal Horticultural Society (RHS). 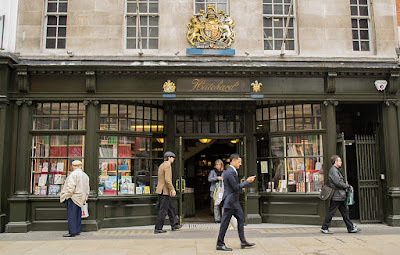 The institution was founded in 1804 as the Horticultural Society of London, and the idea of such an entity was to allow the members to present papers on their horticultural activities and discoveries and to publish the proceedings. And hey! – why not? – also to award prizes for gardening achievements. 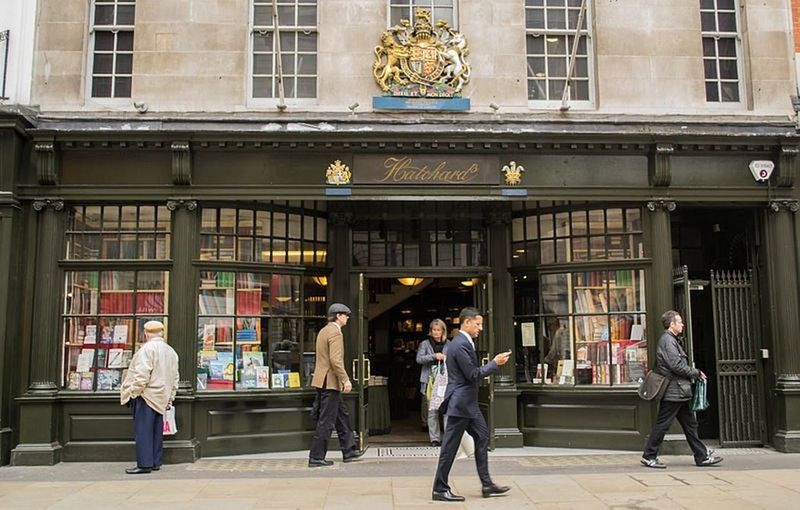 The creation of the society was promoted by John Wedgwood, and eventually the first meeting of seven men took place (March 7, 1804) at Hatchards bookshop in Piccadilly, London. 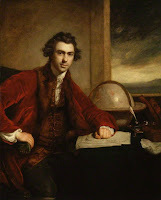 Wedgwood was the chairman, and cohorts included William Townsend Aiton as Superintendent of Kew Gardens, Sir Joseph Banks as President of the Royal Society, James Dickson (a nurseryman), William Forsyth (Superintendent of the gardens of St. James's Palace and Kensington Palace), Charles Francis Greville (think of the genus Grevillea) and Richard Salisbury who became Secretary of the new Society – think of Ginkgo biloba where the botanic name was once proposed to be Salisburia adiantifolia. I am a member of this society, and at the fair expense of $75.31 per year I receive relief should I visit UK gardens, and I am sent the monthly The Garden, a gardening publication that beats the socks off of anything produced in America. Well, I don't travel to England much to get the free admission to gardens, but I enjoy the Society's magazine which keeps me abreast of horticulture in the European region. 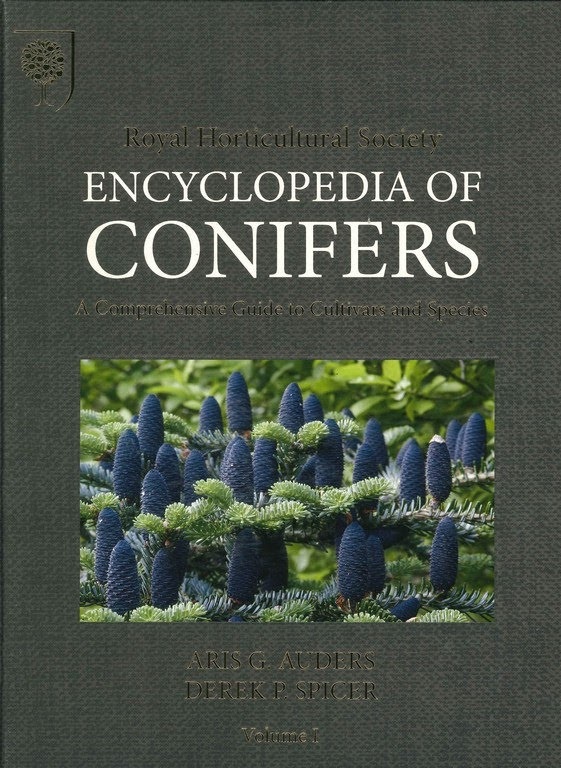 Recently I reviewed the RHS's Encyclopedia of Conifers where I wasn't 100% favorable. 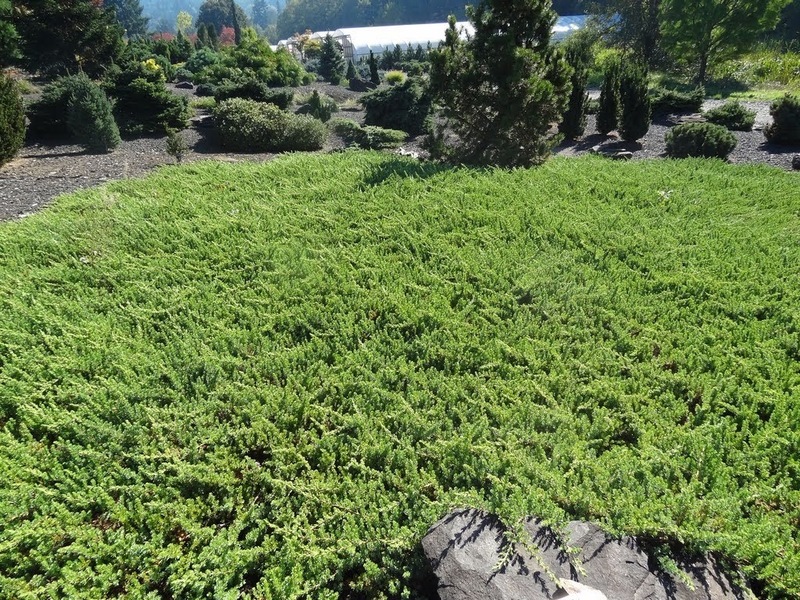 I think I dubbed it as a “great achievement,” but that it contained “mistakes.” And of course it does – no one person or group can know everything about such a huge group of plants such as the conifers. 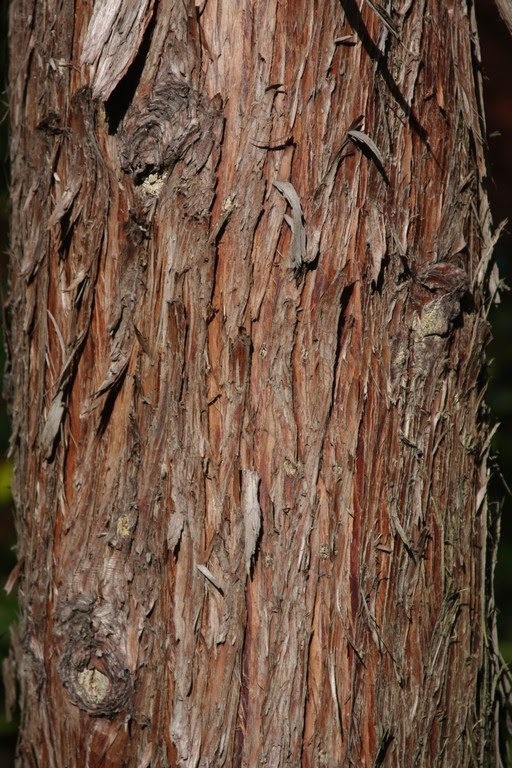 My focus in the previous blog was on the genus Pinus, and I practically beat the horse to death about the wrong-name cultivar of the Japanese White Pine, listed as Pinus parviflora 'Tenysu Kazu'. I'll go so far as to suggest that the RHS produces no further publications without first consulting my Japanese wife, especially when it concerns the proper, correct names for Japanese plants. 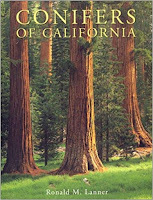 Excluding the genus Pinus, let's take a look at the rest of the mammoth RHS tome on conifers, all 1500+ pages of it. 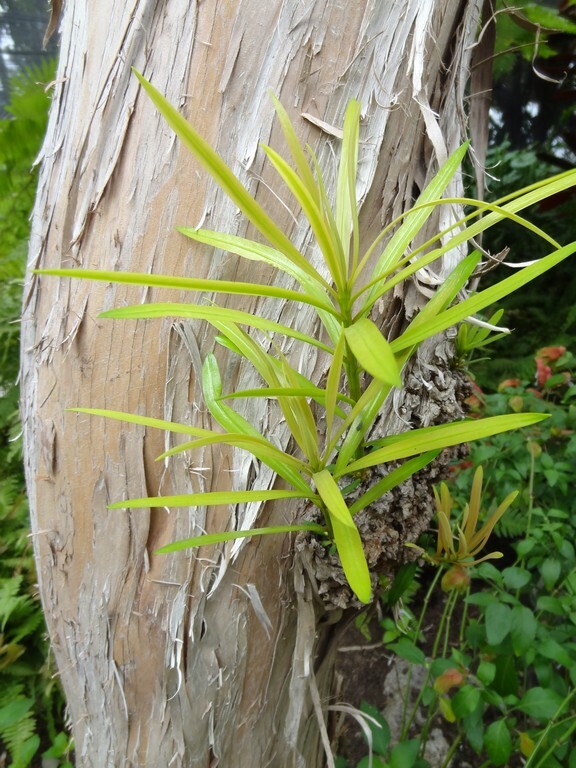 Or rather, let's just narrow our focus on the plants that are photographed from the Buchholz gardens, or where Buchholz is cited as a source of information about certain plants. 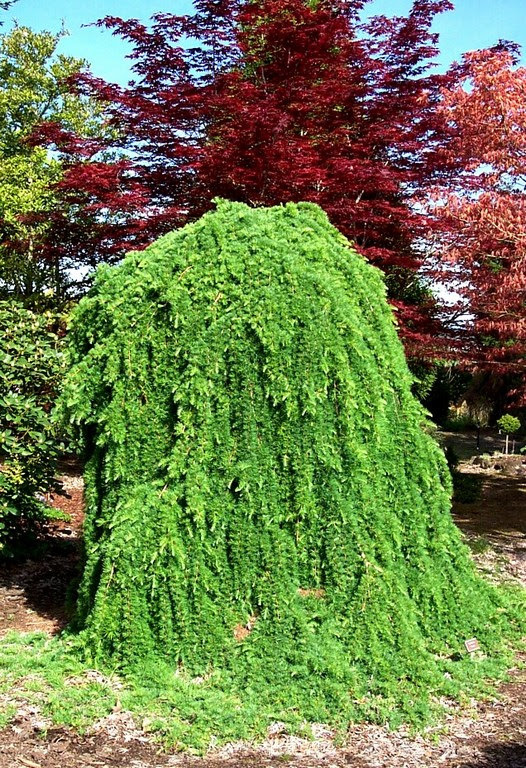 Concerning the latter instance, for Xanthocyparis (Chamaecyparis) nootkatensis 'Van den Aker' – [sic – it should be Akker] the RHS Encyclopedia states, “An extremely narrow, weeping cultivar with pendulous branches and lacy green foliage held very close to the trunk. In ten years 3 x 0.6m. 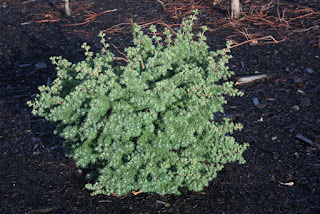 Listed by Buchholz & Buchholz Nursery, OR, USA in 2009.” Apparently, the author – Derek Spicer – of the RHS publication had access to our website plant listings in 2009, and I am cited hundreds of times even though others were growing the plants before me, and I also don't consider myself an authority on many of them. On the same page of the Encyclopedia as the misspelled 'Van den Akker' is 'Sparkling Arrow', and it says, “Originated in 2001 in Buchholz & Buchholz Nursery, OR, USA.” Maybe 2001 is when I first grafted the one variegated shoot from a 'Green Arrow', but it took at least ten years before I had built up enough stock and began to sell 'Sparkling Arrow'. For Xanthocyparis nootkatensis 'Laura Aurora' the Encyclopedia states, “Found in 1984 by Talon Buchholz, OR, USA and named after his daughter.” I did name it after my daughter, but she was born in 1984 and I remember the little tyke running around as a three-or-so-year-old when I named the tree. For X. n. 'Green Arrow' the description says that the foliage is dark green. If you look at the Aris Auder photo on page 1482 from my Blue Forest you will see that the foliage is actually gray-blue-green. 'Green Arrow' is a nice name, nevertheless, but the cultivar did not originate in 1984 by Buchholz and Buchholz Nursery. The original tree was discovered by the late Canadian, Gordon Bentham, growing on government forest land on Vancouver Island. He requested with authorities to harvest a few scions but was denied permission. But he did anyway. 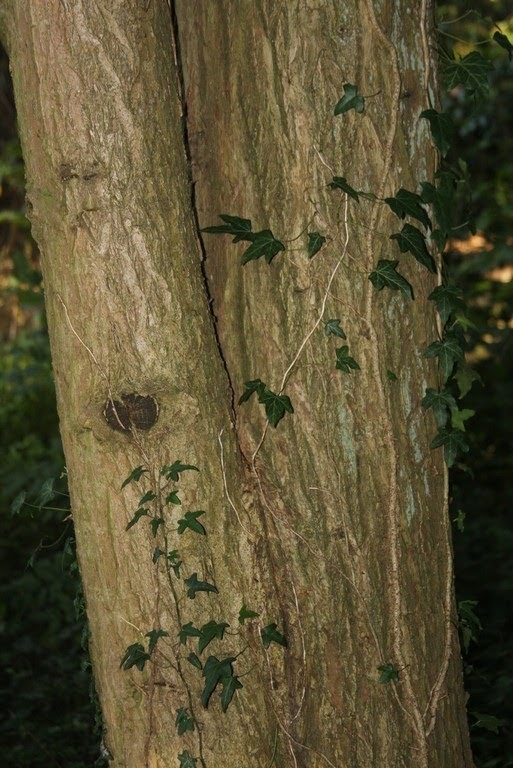 Bentham told me about the marvelous mother tree and that he would name it 'Green Arrow', but sadly he died a couple of years later. By chance I was visiting the bankrupt nursery where Bentham had worked, and there I discovered a dozen unlabeled three-year-old 'Green Arrow' in gallon pots. I bought them and brought them to America and the photo on page 1482 shows some of the original propagules. You could say that I introduced 'Green Arrow' to horticulture for it probably would have been lost had Bentham not enthused about it to me shortly before his death. 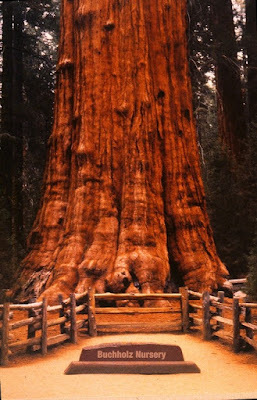 I occasionally wonder about the mother tree: how large is it or even if it is still alive. And sadly, I doubt that there is a person on earth who knows where the original mother stands. 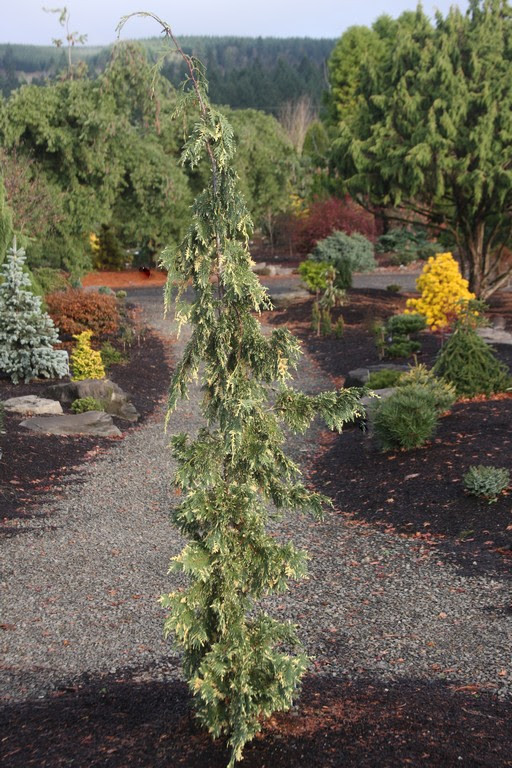 X. n. 'Glauca Pendula' is “Listed by Buchholz and Buchholz Nursery, OR, USA in 2009. The cultivar name in Latin form is only acceptable if proved to have been published before 1959.” I don't have the answer to that because I always considered it a “glauca pendula group.” A 'Glauca Pendula' was in the trade when I began my nursery in 1980 but it wasn't very blue. 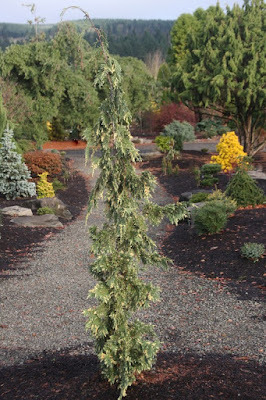 In an old woman's yard in Hillsboro, Oregon I found a better form and (unwisely) attached the 'Glauca Pendula' name to it. The woman is long gone, and so is her house and tree. 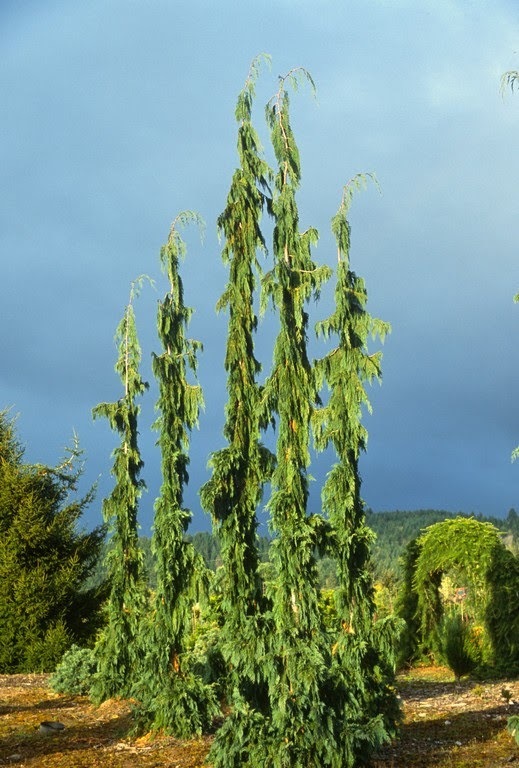 I pulled the Buchholz and Buchholz 1984-85 Wholesale Catalog off the shelf and a one-year-graft of 'Glauca Pendula' is listed at $2.75 ($2.50 for just the 'Pendula'). 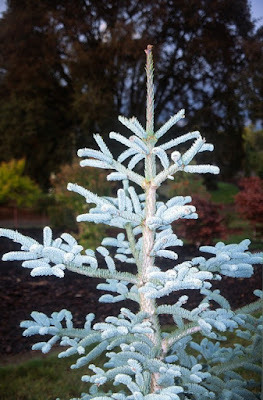 For a description: “The bluest strain we've seen.” ...Which is the Hillsboro tree. I don't produce this “strain” anymore, in fact I don't even have one on my place. I do know where to find scions if I want – a nice specimen is growing in my “Grandfather's” front yard. On page 27 there are two photos of Abies amabilis 'Indian Heaven' which was “found in 1998 in the Indian Heaven Wilderness, WA, USA by Buchholz and Buchholz Nursery, OR, USA.” That's right – I spotted a flash of gold in a green tree on my way to the trailhead. The car continued for a couple hundred additional yards until my brain said stop. Then I backed up until I came to the variegated branch. It was mid-October, not really the time for grafting firs, but I cut two scions and they both lived. Aris Auders' photos* aren't very good and neither are mine (above) because frankly the cultivar has proven to be sparse with variegation and I no longer propagate it. *The Encyclopedia's photos were taken at Wiel Linssen's nursery in Baexem, Netherlands sometime after 2000, but I don't remember ever sending it to him. In any case, I did Linssen no favor really. 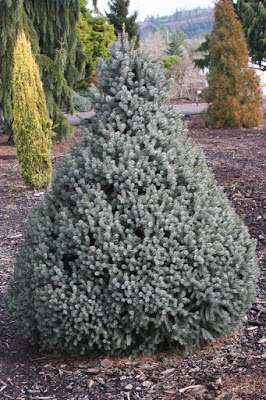 The encyclopedia doesn't offer a photo, but does list Abies procera 'Silver', “An upright plant with stunning silver-blue needles...Originated in 1984 by Buchholz and Buchholz Nursery, OR, USA.” That date seems too early because my nursery was only 4 years old then. Maybe I purchased seed in 1984 – I grew a lot of conifers from seed back then – but I think it was in the mid-90's when I named and began to propagate 'Silver'. But I'm long in the tooth now and I don't remember many events at the beginning of my career. I wish now that I had documented more but at the time I was an obsessed workaholic just trying to make my nursery survive. In 1984 I was working full-time for another nursery, then I would speed home to work at mine at night. I potted my understock at an outdoor table with a headlamp, and then I would graft at the end of my first greenhouse until 11 PM. My current employees, who I appreciate, are nevertheless very “comfortable.” Our summer hours are 7:30 - 4:30, and the crew stumbles in at 7:29 and at 4:31 there's not a soul left – only solo mee, oh. 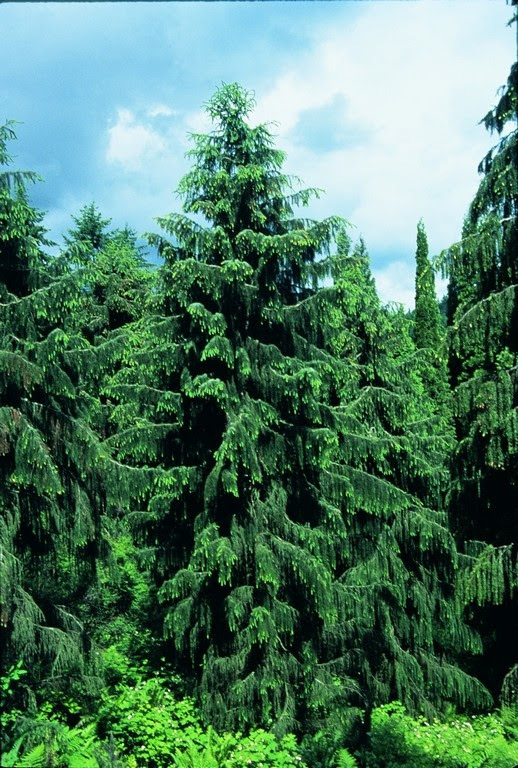 Besides the common conifers of Pinus, Picea, Abies etc. 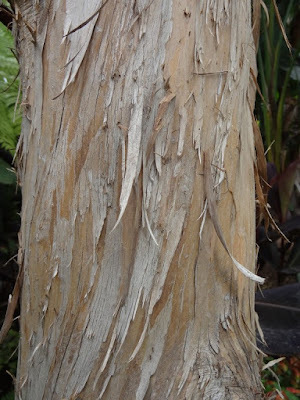 the book lists numerous obscure species, those trees that you seldom see in the trade. In fact some of them I have never even seen. 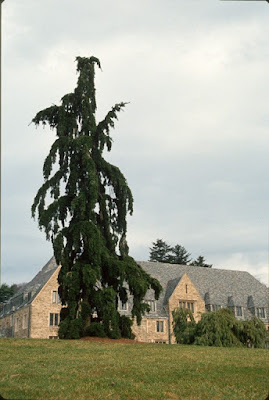 Often accompanying these conifers is the name J. Buchholz, and that is John Theodore Buchholz (1888-1951), a botanist who toiled at the University of Illinois. 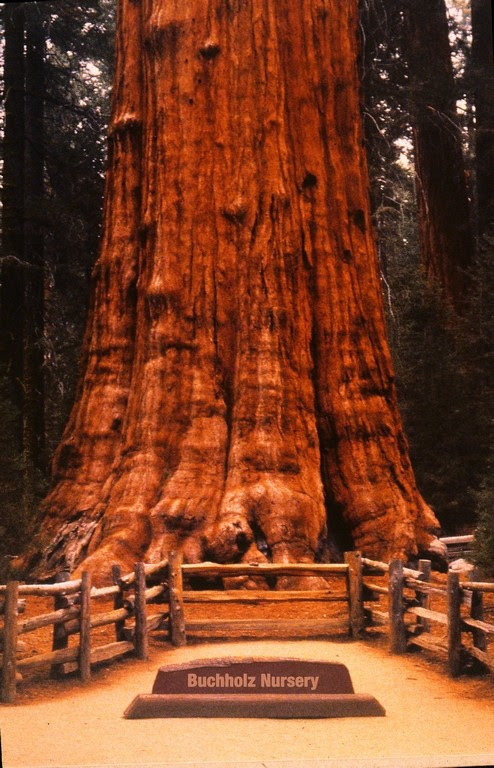 Of course he was best known for convincing the botanical world that Sequoiadendron should receive genus status, separate from Sequoia, and the name of the former was coined by him. I don't know if he ever saw Sequoiadendron in the wild or simply confined himself to herbarium specimens. 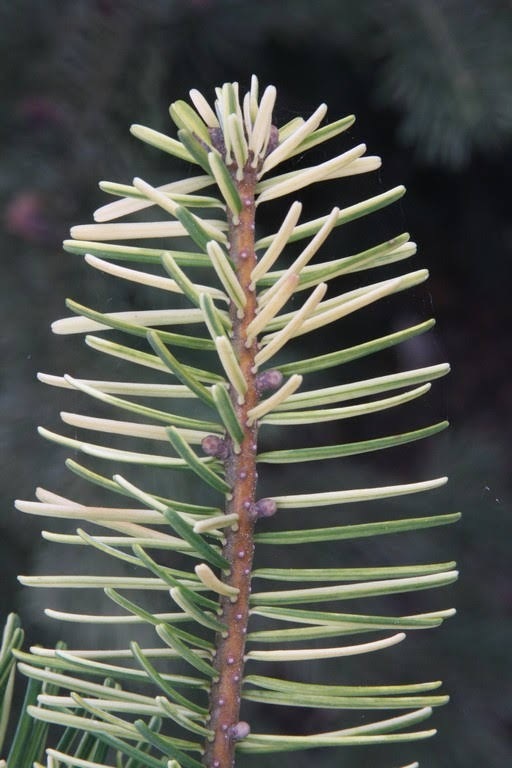 Likewise, I think it was lab-coat/microscope work when he classified or reclassified many of the obscure conifers. Have you ever heard of Acmopyle sahniana, Araucaria bernieri, Araucaria humboldtensis, Dacrydium guillauminii, Juniperus ashei, Libocedrus chevalieri, Retrophyllum comptonii, Podocarpus pendulifolius, Podocarpus rusbyi, Podocarpus sylvestris, Podocarpus tepuiensis and Podocarpus trinitensis? For some reason the scholarly J.T. Buchholz specialized in Southern Hemisphere conifers...most of which I find boring. There is a photograph of Pseudotsuga menziesii 'Graceful Grace' on page 1223 that was taken in our Beyond section at the nursery. 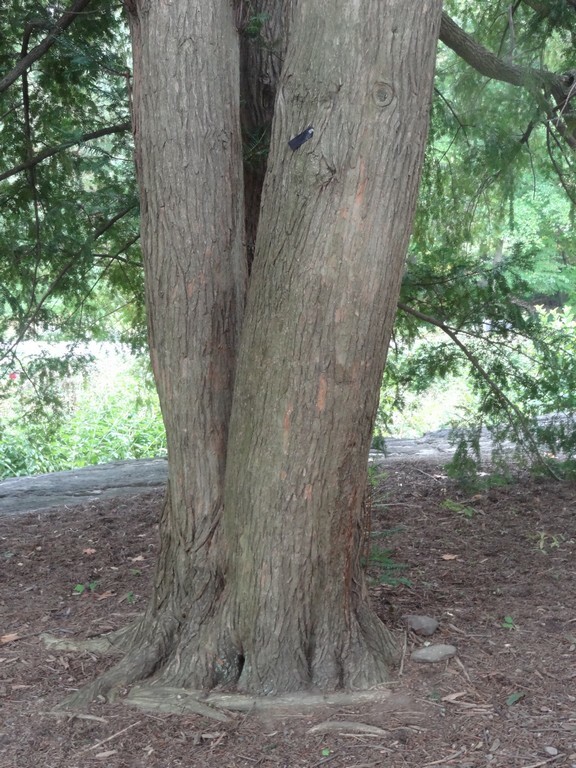 Good thing that Auders took the photo of the 20-year-old tree when it was standing vertically, but now – even though still alive – it has been flattened to the ground. I planted it along the eastern property line and for years the neighbor seemed fine with its existence. Then suddenly he became concerned that I had encroached upon his land. Instead of talking it over the welfare greaseball-loser got hopped up on meth and pushed it over with his tractor. Police were called and Brutus, all 270 pounds of him, confessed to the malfeasance, explaining that it was on his property. At that point the police waved it off and explained that it was now a “civil matter.” I looked at it differently – I am the taxpayer and the police work for me. The crime occurred about three years ago, and by coincidence the county conducted fresh surveys in my area. Guess what? – the 'Graceful Grace' is/was about 12' on my side of the line. Sadly, though, you can never be correct or win against a meth bully. 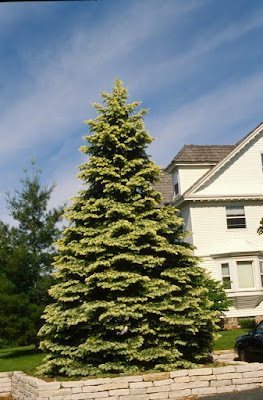 'Graceful Grace' was “Selected in 1967 from seedlings at the Arnold Arboretum by Albert Ziegler, York County, PA and named after his wife.” This cultivar grew for years at a Masonic Home in Pennsylvania and I was fortunate to see the original tree. Then idiots prevailed again and it was cut down to make way for an enlarged parking lot. 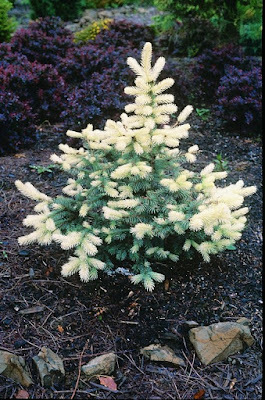 On page 323 is a photo of Cryptomeria japonica 'Dense Jade' from my Conifer Field, and the caption reads “Listed by Buchholz and Buchholz Nursery, OR, USA in 2009.” Then on page 332 is a listing for 'Rein's Dense Jade' which “Originated as a witch's broom on 'Lobbii' by John Vermeulen, USA before 1977.” The latter name honors Rein Vanderwolf, an employee of Vermeulen, but it is the same cultivar as my 'Dense Jade'. I know, it's not for me to shorten cultivar names, even though 'Dense Jade' is a good, adequate name without the need for Rein's. 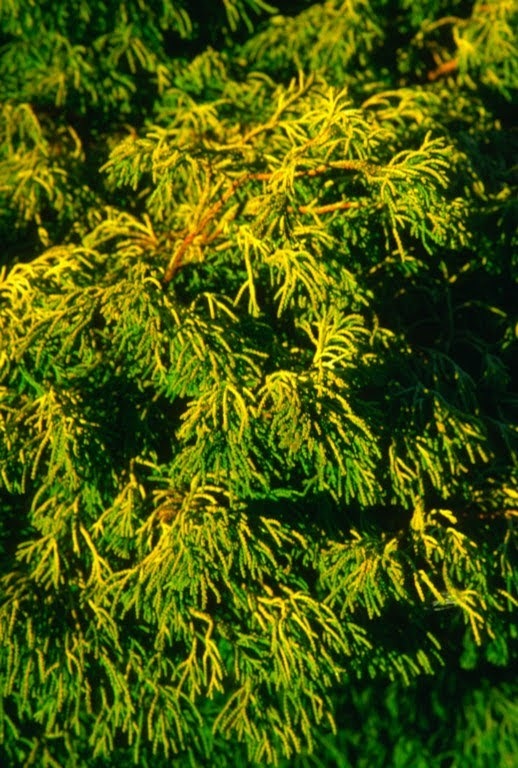 For example, I would never name a plant Chamaecyparis obtusa 'Talon's Lemon Twist'. 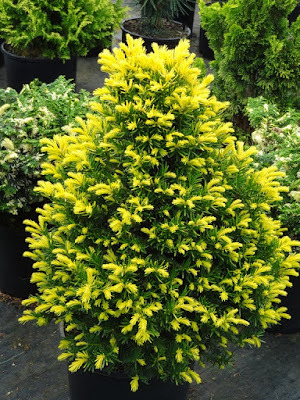 Derek Spicer claims that 'Lemon Twist' was “Found in 1996 as a mutation on 'Tsatsumi' by Buchholz and Buchholz Nursery, OR, USA.” Actually it was found on a C.o. 'Torulosa Dwarf', cuttings of which I purchased from the now defunct Mitsch Nursery of OR, USA, and the mutation was propagated a few years before I acquired a 'Tsatsumi' plant. I love my 'Lemon Twist' discovery and assumed it was absolutely unique. Imagine my disappointment when I encountered a 'Golden Whorl' in Holland at the Linssen Nursery, for the two cultivars look perfectly alike. 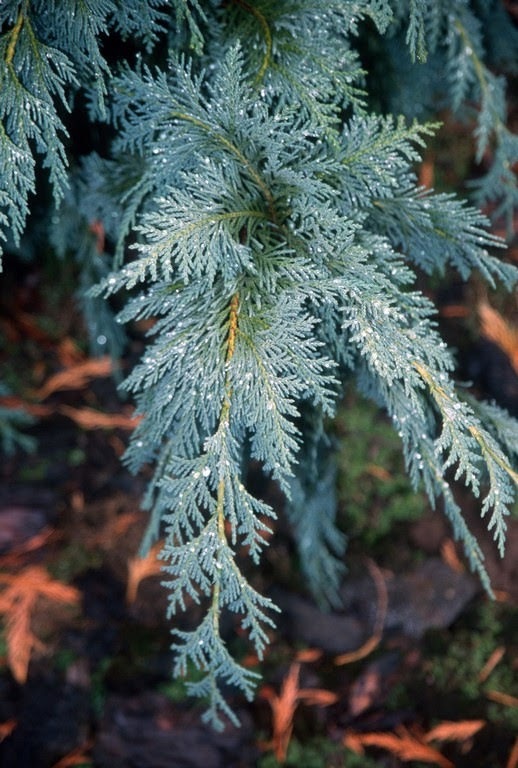 A beautiful full-page photograph of Picea breweriana 'Emerald Midget' is presented on page 617 from our Short Road section. 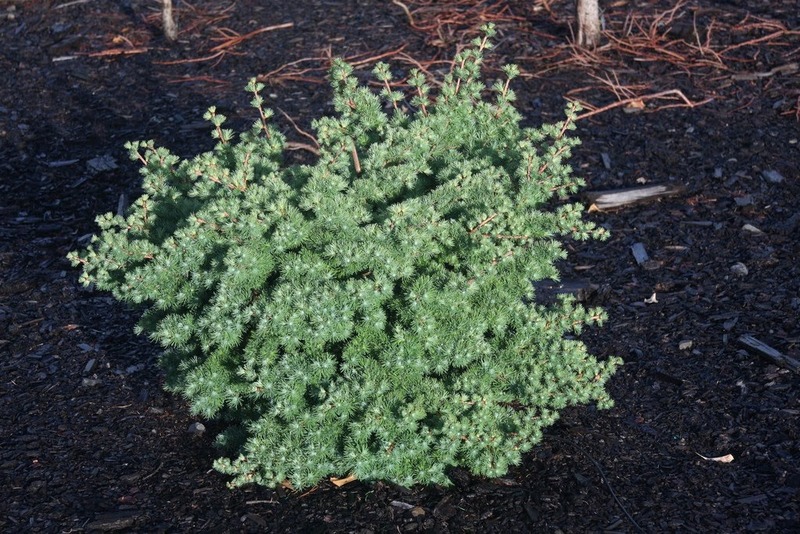 The text states that it “Originated in 1983 as a witches' broom by Buchholz and Buchholz Nursery, OR, USA.” In fact, however, it originated as a noticeably more dwarf and compact seedling. Maybe I sowed the seed in 1983 but quite a few years passed before I named and propagated 'Emerald Midget'. The photo above (mine) and Auders' in the book are the same original seedling tree, and what's interesting is that propagation by grafting onto vigorous Picea abies rootstock does not change the appearance of the dwarf. 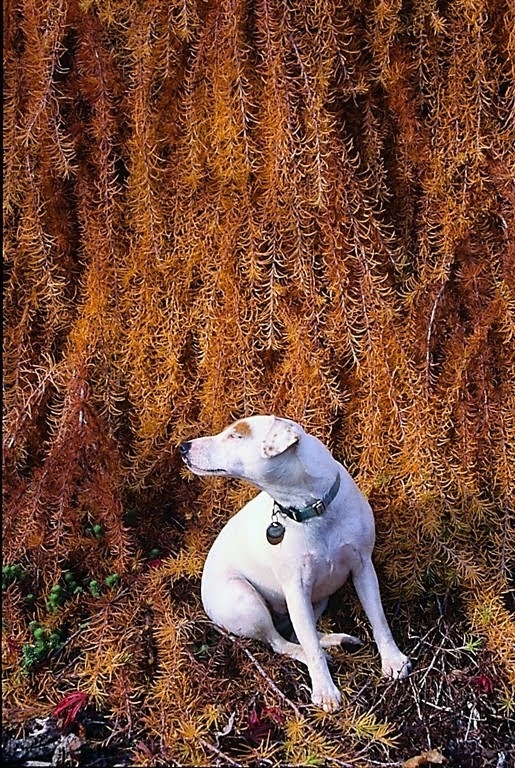 The foliage of 'Emerald Midget' is dark green on the upper surface of the needles and silvery-white beneath. This has led some Dutch conifer “experts” (Smits, for example) to conclude that the selection is a Picea omorika, not a Picea breweriana. 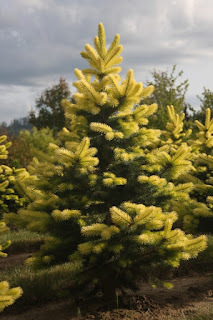 From a distance it actually does look like a Picea omorika 'Nana', but I assure you that if you look at the buds – and I have a stem in front of me now – it is certainly a Picea breweriana. 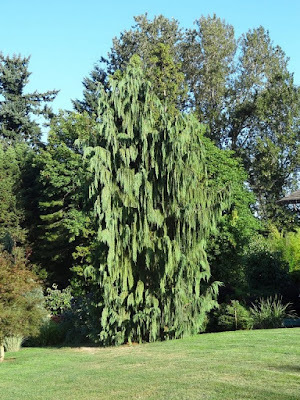 The branchlets on 'Emerald Midget' ascend with no weeping tendency so one might question what's the value of a cultivar of “Brewer's Weeping Spruce” if nothing weeps? 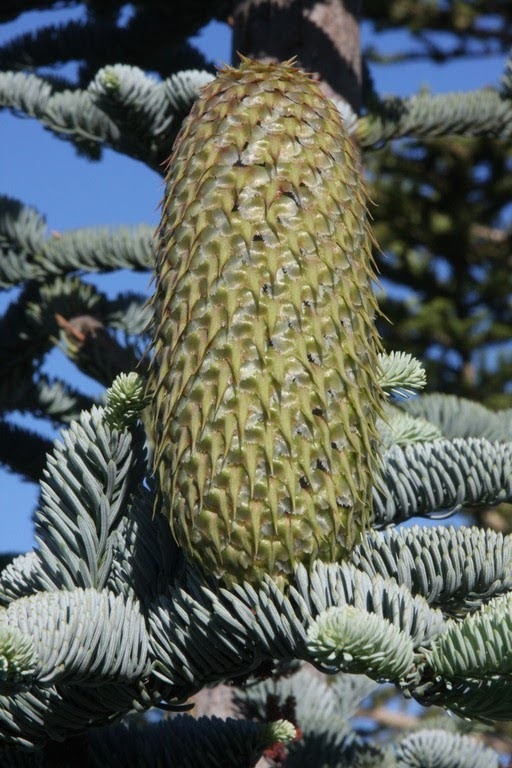 I'll never forget Keith Rushforth's comment in Conifers, “Despite its popularity and the habit, it [Picea breweriana] is not one of the most attractive spruces.” What a bizarre statement! I side with Hillier in Manual of Trees and Shrubs (2014), “Perhaps the most beautiful of all spruces and one of the most popular of all ornamental conifers.” I don't think Rushforth had taken his morning tea when he made his grumpy comment. 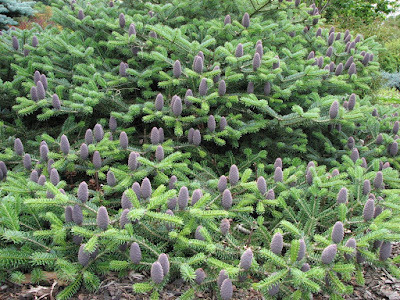 Picea sitchensis is the “Sitka spruce” and there are a handful of dwarf cultivars, some originating as witch's brooms and some as seedlings. 'Sugarloaf' is of seedling origin and it was discovered by Janssen and Reeck on Sugarloaf Mountain in Clatsop County, Oregon about 25 years ago. The Encyclopedia wrongly states that I introduced the cultivar, but it was the two discoverers, the owners of Collector's Nursery, who did so. I was disappointed with the photos of Picea pungens 'Spring Blast' and 'Gebelle's Golden Spring' for they were taken a month too late to appreciate their colorful spring flush. My photos above improve that situation. 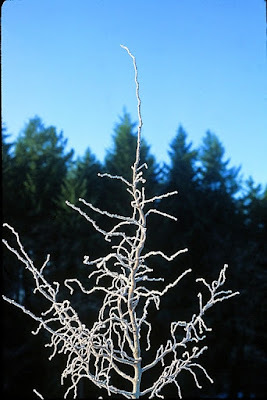 The book's photo is better for Picea pungens 'Spring Ghost' but the text says that it was “Discovered in 1990 by Talon Buchholz...” Nope – it was “discovered” in Minnesota long before 1990 by the owner of Bailey Nursery, Gordon Bailey, Sr. 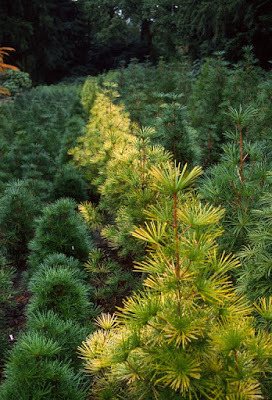 When I began my nursery there weren't many conifer grafters, but Mr. Bailey approached me about custom grafting a certain variegated spruce. I agreed and he sent the scionwood. 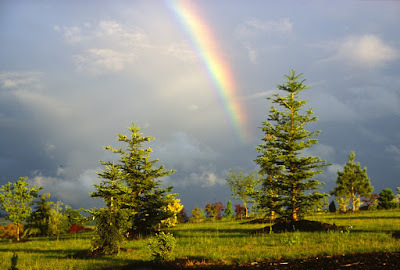 The original seedling – I have a photo of it somewhere – was planted in full sun and it prospered in the Midwest humidity. 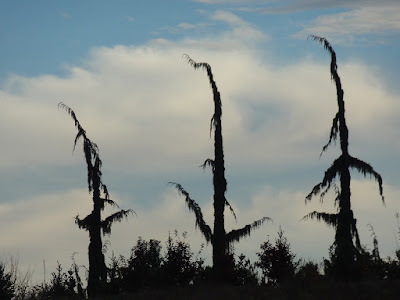 In Oregon it burns, horribly, and an ex-employee dubbed it “Spring Ghost, Summer Toast.” Bailey and I concluded that it wasn't commercially viable, although I do grow a handful now and then. I guess you could say that I named and “introduced” 'Spring Ghost', but it was at least 20 years old when I first received scionwood. 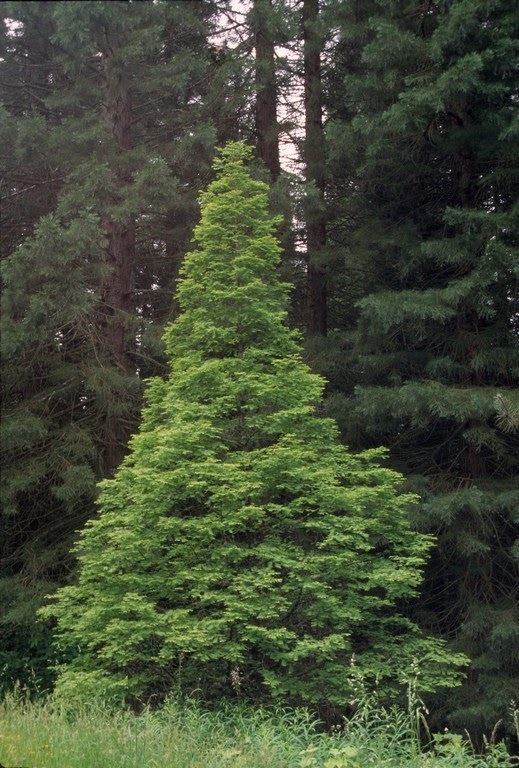 I'm puzzled to read Derek Spicer's text that I discovered a Sequoia sempervirens 'Mr. Happy'. That's news to me or maybe my memory has gone. 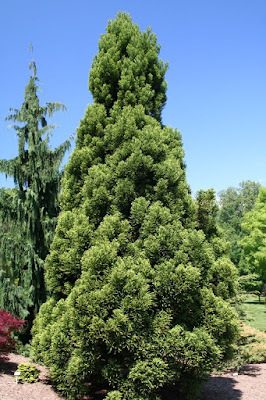 Fortunately there is no photograph because I don't think it exists, and probably there is confusion with my introduction of Sciadopitys verticillata 'Mr. Happy' which is included in the book. It was not my intention to belittle the Royal Horticultural Society's Encyclopedia of Conifers by pointing out mistakes, but they are numerous, even more than what I have included in this blog. I suppose the strangest occurs on page 1461 where Tsuga mertensiana is photographed with a snow-capped volcano in the distance, but the caption reads, “Tsuga mertensiana in its native habitat, in the Cedarberg Mountain, South Africa.” Probably the author is aware of this mistake, because earlier he alludes to the species being native to western North America. So, I'll put my two volume Encyclopedia book on the shelf for now, glad to be through with this blog. I got tired of lugging the heavy books back and forth from my office to my home, and the work might be more user-friendly if it would have been divided up into 4 volumes. 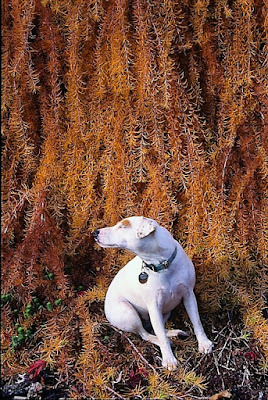 As always we both enjoyed your latest blog on plant names. Since you seemed to be in a conciliatory mind-set I must point out one dangerous error in your account of the Kew Pinus parviflora story. You must not suggest the Royal Botanical Gardens Kew is an affiliate of the RHS!!! If you return to England this could be a hanging offence. The RBG is a government institution with a history stretching back far longer than even the illustrious RHS which is still funded largely by membership fees whereas Kew has government funding. The two institutions do converse but there is some level of rivalry well illustrated by the Kew-Wisley race which did/does? take place annually between the Kew, Wisley students. Possibly like the clog and apron race which was another student event at Kew and involved running down the Kew Broadwalk (about a quarter mile) wearing standard issue clogs and an apron, but I suspect this no longer happens. I am not surprised to hear of your reception regarding the incorrectly named Pine. I have a plant from Kew with the wrong generic name. It happens to us all! It's tough for us Americans to keep the English "Royal" stuff straight.